Fabergé Imperial Pelican Egg, General Information, click here. In the Winter of 2008-2009, I took a virtual journey to the palaces and yachts depicted on the Danish Palaces Egg. The long Winter of 2009-2010 presented another opportunity to take a similar trip, this time to the buildings depicted on the miniatures of the Pelican Egg. I also remembered the workmaster was Mikhail Perkhin (1860-1903), and the Egg was a gift for the Dowager Empress Maria Feodorovna (1847-1928) and is inscribed on the gold exterior of the Egg with the dates 1797 and 1897, and Visit our vineyards, O Lord, and we shall live in Thee. Pelican Egg Half-open. Courtesy von Habsburg, et al. Fabergé, 1979, 116. The Catalog Raisonné (1995) for the Pratt Collection in Richmond2 states all the institutions depicted on the miniatures are in St. Petersburg. The 1996 Fabergé in America3 exhibition catalog and the book, Fabergé Imperial Easter Eggs (1997)4, do the same, yet one of the inscriptions on the back reads Московский Сирот. Николаевский Инст. основ. вь 1837 году (Moscow Orph. Nikolaevski Inst. founded in 1837). I could not believe Fabergé's workmasters made mistakes like mixing up the cities of St. Petersburg and Moscow. To complicate matters a bit further, an unfortunate identification reversal on the miniatures occurred in the 1995 catalog. So I set out to find all of the buildings and their locations, and to learn about the historic significance of each. Six of the eight gold ovals containing the miniatures are engraved on the back with the names and founding dates of the institutions depicted on the front. Two of the ovals each have two inscriptions, the other four just one inscription; the first and last oval backs are not inscribed as they form the front and back of the Egg when closed. The original Russian inscriptions I reconstructed from a photo my Fabergé friend George W. Terrell, Jr., shared. The inscriptions translated into English are on the page where the miniatures are explained. Courtesy George W. Terrell, Jr. The identification of the miniatures matched to photographs of the same buildings from internet research is told in A Fresh Look at the Pelican Egg - The Miniatures Explained. The inscribed dates 1797 and 1897 I could clearly see on photos of the Egg, so I only had to find all the centenary celebrations and match them with earlier research. In A Fresh Look at the Pelican Egg - Historic Connections these dates and celebrations are explained. The inscription of what appeared to be part of a psalm I could unfortunately only see partly: "и вы живы будете" which translates as "and YOU shall live". This inscription seems important in view of the text, "Visit this vineyard", I found later on old uniform buttons. I began wondering if the inscription perhaps was more correctly translated: "Look down from heaven ... visit this vineyard and you shall live".5 I concluded the inscription thus might be a metaphor with the institutions being the vineyards where life was possible for the poor and needy, etc. Regrettably, the solution for the puzzle will have to wait until the exact inscribed text in Russian is made public. I traveled many virtual miles to find that the swan was not a swan, but a pelican. I should have asked an ornithologist in the first place, but what a relief! Fabergé's bird is a pelican and there was good reason for it to be what it is. 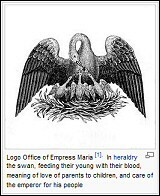 The pelican has stood as a symbol for self-sacrifice and nurturing for centuries.7 The first charitable institution in Russia, whose founding in 1763 was approved by Catherine the Great herself, had as its emblem, a Pelican Feeding its Young. 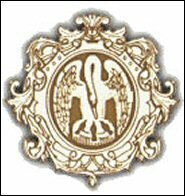 Officials of the institution wore uniforms with buttons depicting either the pelican or a vineyard. To understand Catherine the Great's relation to an Egg made more than a hundred years later for Tsarina Maria Feodorovna, the wife of her great-great grandson Tsar Alexander III, I had to go back in Russian history to find the historic connection for the Pelican Egg. That story, A Fresh Look at the Pelican Egg - Historic Connections, is told here. 1. Lowes, Will, and Christel Ludewig McCanless. Fabergé Eggs: A Retrospective Encyclopedia, 2001, 57. 2. Curry, David Park. Fabergé: Virginia Museum of Fine Arts, 1995, 66-69. 3. Curry, David Park in von Habsburg, Géza, et al, Fabergé in America, 1996, 159. 4. Fabergé, Tatiana, Proler, Lynette G., and Valentin V. Skurlov. The Fabergé Imperial Easter Eggs, 1997, 133. 5. St. Michael Online: Advent Scripture Readings, Songs, Psalms, and Prayers and Biblos Psalm 80:14 Parallel Translations. 6. Fabergé, Tatiana, et al. The Fabergé Imperial Easter Eggs 1997, 255 (Appendix 4, 14). 7. Donna Hrynkiw - The Medieval Pelican.